Don’t Repeat Yourself is the perennial mantra of the software developer. 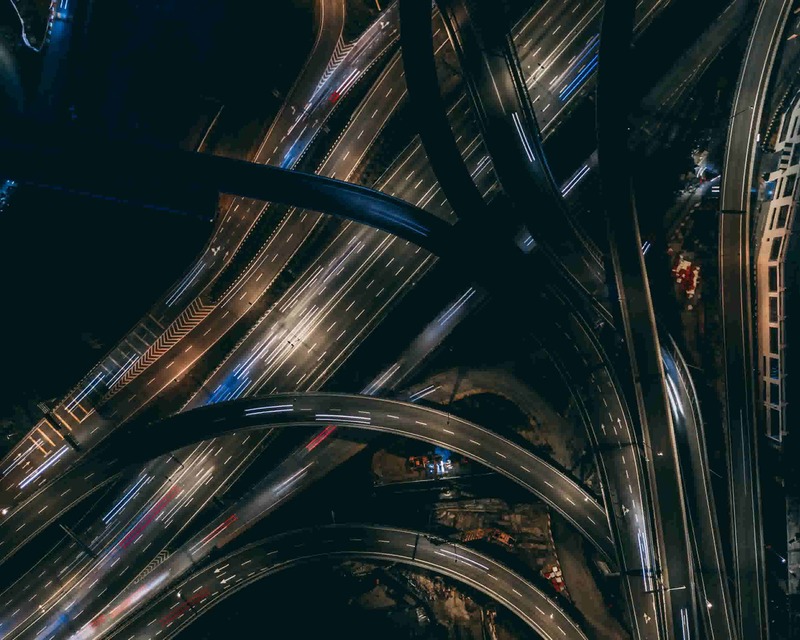 It doesn’t mean you should never do the same thing twice, but instead refers to having a single, authoritative source of truth for every piece of information used in your software. Don’t Repeat Yourself is frequently applied to code, where knowledge is susceptible to duplication through the copying and pasting of code blocks where an abstraction should be used instead. This wisdom can similarly be applied to your website’s content, as updating content that is duplicated across a site can be tedious and error-prone. In this article, I will show you how you can use Hugo to organize and link content items together for a resilient and highly maintainable content strategy. Let’s say we have a website that displays information for specific events. We want to include venue information for each event, including the venue’s address. We hold these truths to be self-evident, that this party is going to rock. This is an easy way to link items together. Since I added monticello as the venue for this event, a taxonomy term page will be created at /venues/monticello. This page will display all the events happening at monticello. To add additional information to our venue, like an address, we can create an index page for it at content/venues/monticello/_index.md and adding front matter to that file. This will let us add an address to our venue, but unfortunately, this information is only available on the taxonomy term page. If we want to display this venue information on the event page, there is no way to retrieve it. We need a different solution! Instead of using a taxonomy to keep track of our venues, it might make more sense to add them as pages to their own content section. A content section in Hugo is nothing more than a folder inside the content directory containing markdown files. One reason why you may not want to keep your data in the content section is because, by default, all markdown files in content are turned into HTML pages when the site is generated. However, since version 0.35, you can create headless bundles in Hugo. A headless bundle is a collection of pages that will not get published when the site is generated. You can’t query headless bundles with .Site.Pages or .Site.RegularPages, but you can retrieve a page bundle with .Site.GetPage. Our monticello.md file is now the single source of truth within our site for information about this venue. We use .Site.GetPage to load up all the items in our venues bundle. It’s a little counterintuitive; GetPage sounds like you’re getting a single page, but when using page bundles you need to use GetPage to access the entire bundle. Once the venues bundle is retrieved, we use .Resources.Match to search all the pages in the bundle to find one whose filename matches the venue in our event front matter. When we find a match, we then output the venue information on the event page. Keeping our venue information in a single location adds resilience to our content strategy. If an error is made when typing in the venue address, it only needs to be corrected in one place and it will be updated everywhere the venue is referenced. Additionally, users creating new content don’t have to manually enter the venue’s address every time a new event is created with that venue. One reason I like using page bundles for miscellaneous data is because of how well they play with Forestry’s content manager. Forestry’s configurable sidebar, front matter templates, and dropdown data sources all work together to provide a great way to manage these data relationships. After importing your site to Forestry, navigate to the Front Matter section in the sidebar. Click the Add Template button to create a new template, and name it Event. Add a text field named title, and a select field named venue. Select fields in Forestry’s Front Matter Templates have multiple data source options. Under Source Type, select Pages to populate the venue dropdown with options from one of your page sections. After selecting Pages, you will see another dropdown to select which Section to show pages from. Select Venues as the section to enable users to select from the pages in your venues page bundle when assigning a venue to an event. This code gets the basename of your path by splitting the string on the directory separator and using the last item in the resulting slice. Forestry’s configurable sidebar allows you to configure which content sections can be accessed and edited in Forestry. Access the sidebar configuration by navigating to Settings and going to the Sidebar tab. You will see your content sections listed there. Click on the Events section to edit it. Scrolling down to the bottom of the modal that pops up, you will see a dropdown to select the Available Templates for this content section. 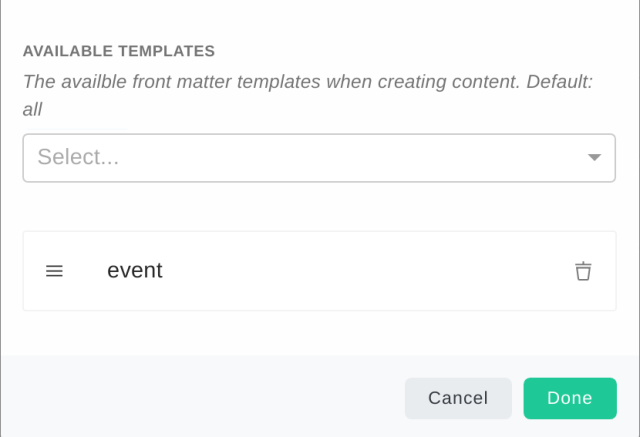 Only allowing a single template here will force all new content to be created with that template, so selecting our recently made Event front matter template and nothing else will make sure all new events created will utilize our venue dropdown. Click Done and then hit the Save button to update your repo with these changes. Thanks to Forestry’s front matter UI, it’s easy to apply this content strategy to your site while keeping things easy for content editors. This tutorial only scratches the surface: by following the wisdom of Don’t Repeat Yourself and building data relationships with page bundles, Hugo offers a static platform with lots of possibilities! Next week: We look at the differences between some popular Continuous Integration Tools. Last week: We looked at VuePress, a static site generator that's great for documentation.